This concise, accessible, and authoritative guide covers the broad area of the forensic medical sciences, delivering core knowledge in the biomedical sciences, and the law and ethics surrounding them. 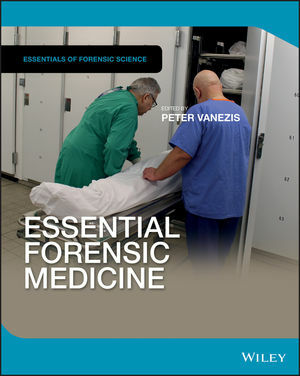 Written by a recognized authority in the field, Essential Forensic Medicine offers complete chapter coverage of the legal system, courts, and witnesses; investigation of the deceased and their lawful disposal; and the duties of a registered medical practitioner and the General Medical Council. It instructs readers on the general principles of scene examination and the medico-legal autopsy including how to interpret the many kinds of injuries one can suffer—including those from blunt impact and sharp force, firearms and explosives, asphyxia and drowning. Further chapters cover sexual offences, child abuse, and using DNA in human identification, mental health/forensic psychiatry, alcohol and drug abuse. Part of the ‘Essential Forensic Science’ series, Essential Forensic Medicine is a highly useful guide for advanced undergraduate students, Masters students, and new practitioners to the field. Peter Vanezis, MB, ChB, MD, PhD, FRCPath, FRCP (Glasg. ), FFLM, FCSFS, FAFMS (UK), DMJ (Path), He has been Professor of Forensic Medical Sciences and Director of the Cameron Forensic Medical Sciences at Barts and the London (Queen Mary University of London) since 2006 (now Emeritus). He was formerly Regius Professor of Forensic Medicine and Science at the University of Glasgow. He is a Fellow of The Royal College of Pathologists, Fellow of Royal College of Physicians of Glasgow, Fellow of the Faculty of Forensic and Legal Medicine and Fellow of the Chartered Society of Forensic Scientists. Peter Vanezis was awarded an OBE in June 2001, for Forensic Pathology Services in Kosovo.